The sd2snes diagnostic firmware is used to track down hardware issues with your sd2snes. I originally wrote it for brief burn-in testing (e.g. to check for solder errors) but it might be useful in the field as well. Download the diagnostic firmware (see link above) and unpack it to your SD Card just like a regular firmware update. Put the SD Card back into your sd2snes and turn on power. If right after startup either the green LED light up or the yellow+red LEDs light up and nothing else happens (no intermittent LED flashing etc. ), the SD Card could not be initialized. It might be worth trying a different card. Otherwise there is a contact problem with the SD Card slot (hardware failure), or the sd2snes’s microcontroller doesn’t boot up properly anymore. Tests cannot continue in this case. The final test is the SNES bus test. During the test the screen will turn red, orange, yellow, and finally green if everything is ok. If the screen remains black for more than 20 minutes something’s up. Testing is finished when the three LEDs light up in sequence like a running light. CIC test: checks for correct operation of the SuperCIC key. Toggles video modes/power LED color if SuperCIC lock is installed in the SNES. Clock test: loads the test ROM, measures the SNES master clock and checks for irregularities. Also logs a number of other control signal toggle counts for manual inspection (to check for broken traces/solder joints). Address bus A/Data bus test: tests whether the SNES can correctly access (read+write) all of the available address space. Not the most useful test because in most cases the test code can’t run if something is wrong with the address or data bus. Thanks for the reply Ikari. I think the dimming LED is down to the capacitors on the SNES machines meaning the power is not up to the job. The “/sd2snes” path is actually missing! Will need to check again in the morning. Thank you for the help so far. PA test is related to the B Address bus on the extension pins. Most likely bad solder joints on RA101, RA102, RA111, RA112. Thanks , I see the RA112 with possible bad solder, but my snes is now with black screen (It shows nstc black screen without sound, ¡. The scart 2 hdmi detect black screen NTSC signal), I am waiting other sfc or repair this to continue with sd2snes. Yes I recognized a “bug” (more like a bad timing) when sampling the address/data bus so DSP can miss some writes on some consoles. This is fixed in the next release. Thanks very much, I will wait next firmware. More I never had a problem with him, worked always normal, you have to help me? lack any application? Hey Ikari, I have the same results as Henrique, any tips on getting the IRQ/RAM/PA tests to pass? I have some experience with soldering. The CIC test will deliberately trigger a CIC error to see if CIC signaling works. At that point you need to do the double reset or the SNES won’t be alive to carry out the SNES tests later on. If the SNES isn’t reset after a bit, the CIC test will mark itself as failed and the tests will just continue, with the SNES tests failing at the end. the console might be ok but the sd2snes isn’t :( there is a bad solder connection between FPGA and RAM. Rev F, but, I dont now, china version or not. Looks like you didn’t push reset twice when it asked you to (LED blinking code as described in the text) ;) Seems fine otherwise; does it work in normal usage? I guess solder joints are broken on the sd card slot or some contacts inside it. Or maybe it’s just dirt :) You could try blowing some pressured air into the slot or putting some isopropyl alcohol on an SD card’s contacts and inserting and removing it a couple of times. well well! I opened the top of the slot, I think the contacts are good, I also isopropyl, put a drop of solder on each contact on the board used a welder, but nothing has changed. Hm! I can only imagine that the CD (Card Detect) switch is somehow damaged on the card slot or the connection to the MCU is broken somehow. It is this pad/trace: http://imgur.com/a/oYdw3 It goes from the card slot to the MCU (80pin IC) on the other side of the board. really, you saved me !!!! are two small arms, one of them gave no contact! I pushed him inside, and now works !!! thank you so much!!! Question: rev. F is without LEDS ?, My PCB did not have, I even installed !! I did the test and this are the results. there’s something wrong with the snes? Hi, sorry for getting back so late. Does your sd2snes work normally outside of the diagnostic test? Hm, diagnostics aside – can you test a number of firmware versions (I’d suggest v0.1.6, v0.1.7b, v0.1.7c) and see if any of them works better or worse? I’d like to know if that changes the behaviour in any way. Plz halp. Stays blinking red and yellow after resets. No video. I touched up the solder on the resistor blocks to no avail. The text saying “FPGA is stuck high” makes me think maybe its a bridge and not a cracked solder joint. Then again I have no clue. Ikari, what kind of LED is used on the boards? Mine came without the LEDs and I would like to solder them on the board. Thank you! I have read maybe is problem with solder. 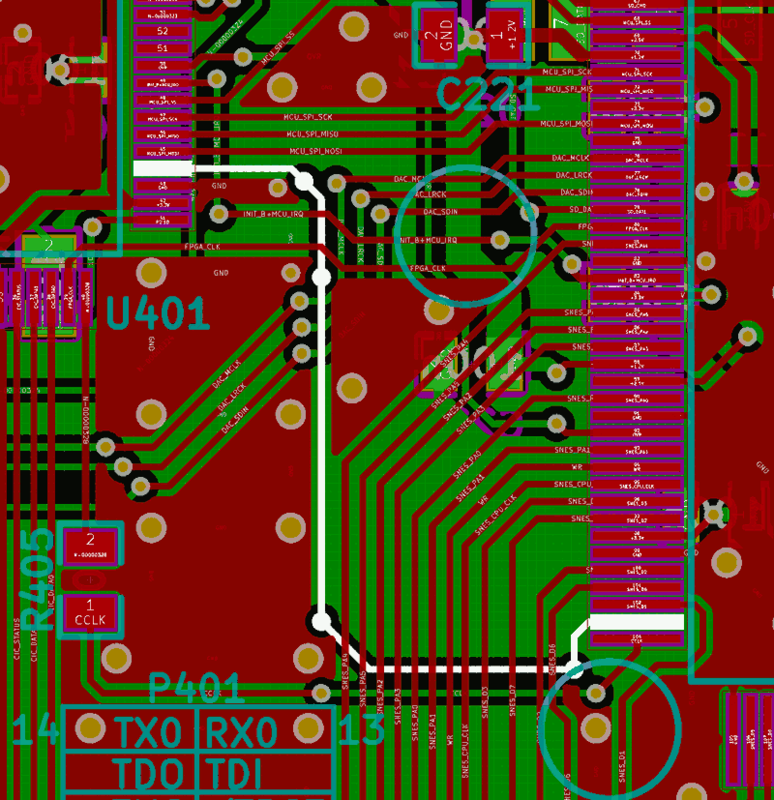 Which part from the pcb i’m must check to apply solder? I have this problem that popped up overnight. The LED blinks yellow after booting up and there’s no video… can’t find anything on this problem so far. no response from FPGA trying to initiate configuration! did you solve this? exact same error here. maybe with an older firmware? That’s a defect with the sd2snes itself. Either the RAM is damaged or there is a bad connection between the BGA RAM and FPGA. And how can be fixed? TEST SUMMARY ============ flash check: 1111-4-33b04504-dfb09a7f-b8-11-0 Test Result —————- SD Passed USB not implemented RTC Passed CIC no run FPGA Passed RAM Passed SD DMA Passed CLK Passed DAC not implemented SNES IRQ FAILED SNES RAM Passed SNES PA Passed https://i.gyazo.com/b5af29da286110b08df0dd323e65e50f.jpg this is the image i see on boot up. I can play normal cartridges. I can save game play normal. With no SD inserted in SD2SNES, I get a clear “NO SD inserted”… but with all versions of firmware installed, this is what I see. What can be the issue? Batterry? Pb fixed by resoldering ra101,ra102,ra111 and ra112. Could you take some pictures of both sides of the circuit board? Rev. E2 only was a small number of carts I built and shipped myself (~130pcs). That makes me so angry, I bought for a price that is the same of the legits, I am impressed that they make so close to the real one, you should implement a check to get this lousy fake ones, but them my cart would not work any longer, thanks anyway. Hi, I have black screen, yellow led blinking and green and red down. Where is the diagnostic firmware? This page says (see link above) but there is no link I can see. The Downloads page points back here. Where is the download link for the diagnostics firmware? The downloads page points back to this page. There is a download link in the first sentence on this page. Hello i wondering about quality SD2SNES. It’s really original product? Please help! not yet sadly. I’ve prepared a slightly more sophisticated diagnostics firmware for Mk.III which I am planning to backport to Mk.II as well. Instead of a full array scan of the RAM it does more punctual checks for address and data line connectivity and can also detect shorts. It is able to run on 11 working address lines towards the SNES and thus can detect a range of SNES bus connectivity errors as well.